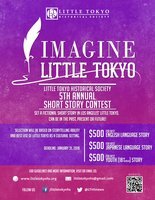 The Little Tokyo Historical Society (LTHS) seeks fictional short stories for its fifth annual Imagine Little Tokyo short story contest in the categories of English language, Japanese language and youth (18 and younger). The deadline is January 31, 2018. The purpose of the contest is to raise awareness of Little Tokyo through a creative story that takes place in Little Tokyo. The story has to be fictional and set in a current, past or future Little Tokyo in the City of Los Angeles, California. The short story committee will be specifically looking for stories that capture the spirit and sense of Little Tokyo. Each category winner will be awarded $500 in cash with their short story being published in The Rafu Shimpo and Discover Nikkei website. A public award ceremony and dramatic readings of the winning stories are also being planned for spring 2018. "The contest opened doors for me," said Sarena Kuhn, the 2016 youth winner. "It introduced me to writers in the Japanese American community and gave me an opportunity to read at a book festival and become a judge for the following year." lthistory . Última actualización Ene 06 2018 7:40 p.m.